Diabetes is medical condition wherein the blood sugar level is above the normal levels. It is not life threating if you take proper care of your health. Over 100 million people live with diabetes. Diabetic patients should take care of their diet else the condition will worsen. You can ask your loved one to remind you about medicines. But this won’t help you. You may unknowingly eat sugar rich food item. Medicine will only reduce the glucose level. To keep the blood sugar level at the lowest possible levels, you should track the blood sugar levels often, eat carb sugar food, monitor your weight, etc. Here are the best apps for managing diabetes in the smartest possible way. To get started with mYSugr, you must provide your email address. After entering your email ID in the text box, tap on the next button. Now select the region where you want MySugr to save your data and enter a password in the text box. Once you do so, select the OK option. Now, the MySugr app will prompt you to select the diabetes type, the type of insulin therapy you undergo, and the medicine you intake. Then, it asks you to select your preferred BG level and carbs count format. The app will now open its main interface where you’ll find a graph and options to add breakfast, lunch, and dinner details. It will also display options to add the mood and health conditions such as a headache, pain, menstruation, etc. The mYSugr app allows you to go through your health report and it provides an option to export the same to a PDF, CSV or MS Excel document. The app can import your fitness data from the Google Fit service. DM is an app that allows users to manage their diabetes condition with the help of Android or IOS device. The app is easy to use. First-time users of DM are prompted to accept the terms and conditions. To use the application, you don’t have to register an account. Users who create an online account with this app enjoy more features. 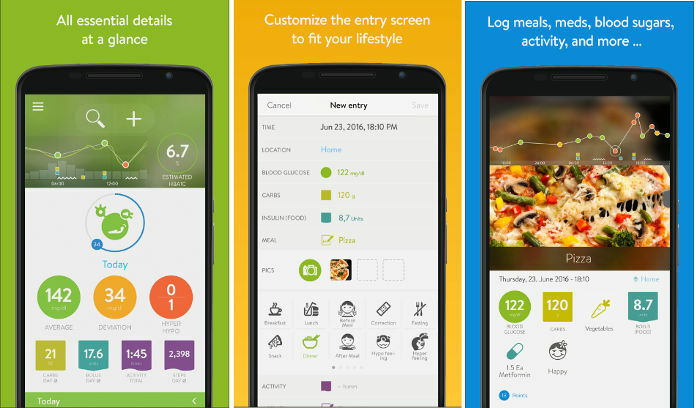 Diabetes: M app asks users to enter weight, height, birthdate. You can ignore this step and head over to the main interface. 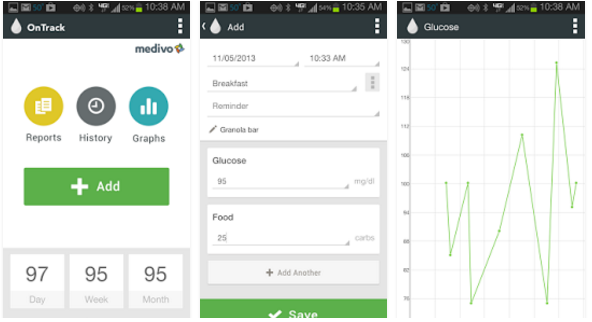 The diabetes application lets users track their BG levels. It features a calculator tool that accepts the glucose level and cars as input and generates the total insulin and bolus in your blood stream. 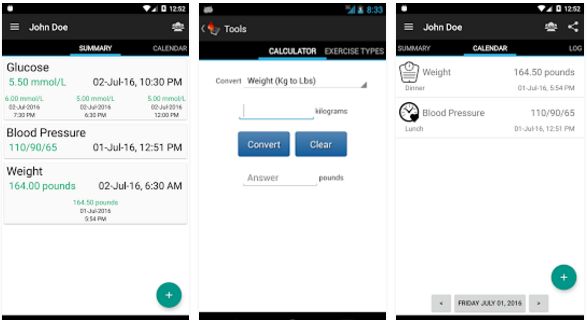 The diabetes app has a logbook utility through which you can record your activities for a given time of the day. If you’ve undergone lipid, microalbumin tests, you can enter the test results through this interface. GB is a simple app with several interesting features. Furthermore, it doesn’t require registration. You can use Glucose Buddy without turning on the WiFi or mobile data connection. App info: This interface allows users to enter the personal details i.e. weight, age, email address, gender, insulin tools you use. Logs: To enter the details medicine prescription, blood glucose level, food you’ve intaken recently, activities for the day, A1C test results, open the Logs utility. Graphs: This module generates a useful graph of the data you’ve submitted with the above two functions. 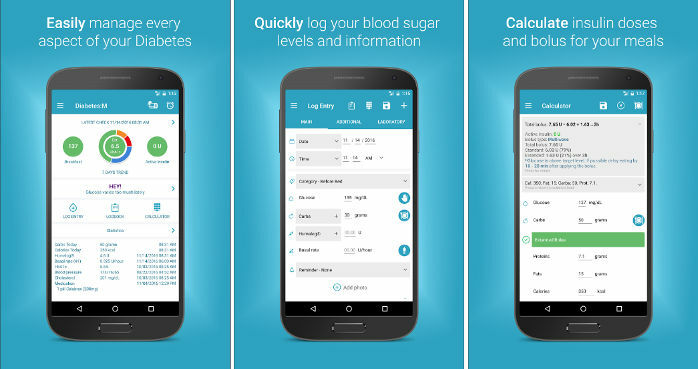 Settings: Here, you’ll find an option to sync the data with glucosebuddy.com, export logs, change the default BG target range, blood glucose, weight tracking units. Reminders: With this function of the Blood Glucose app, you can event or time reminders. Glucose Buddy is one of the best diabetes apps for mobile devices running on Android or IOS operating system. Low and high C6H12O6 level. The wizard also has an option to turn on multi-entry utility through which users can enter multiple details at a time. Glucose range, level by the time of day. Medications, HbA1c levels by time. Daily carbs, pulse and the weight by time. OnTrack diabetes app has a powerful history tool that enables you to filter data by the category of food, date, etc. It displays the daily, weekly and monthly glucose level on the main interface. The app lets users set reminders. It supports US and SI units. The Diabetes Journal app has tabbed UI. It features an option to add Glucose level, blood pressure, weight, HbA1c, carbohydrate count, exercise type/duration, and the medicine you’ve taken. Diabetes Journal will display process the information you’ve entered. Then, it will generate a summary of the data. 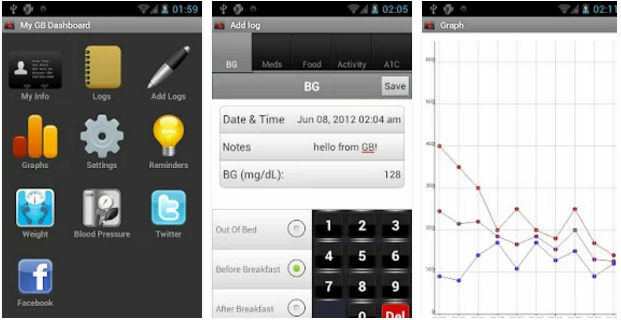 The app can generate graphs of your BP, weight, insulin, etc. It has a reminder function that can remind you to take medicine, exercise, check weight, etc. Conclusion: High BS levels can impact the functioning of other organs in your body. Hence, take care of your health. If you use the best diabetes apps mentioned above often, you’ll have the details the sugar levels, weight, food you intake in hand. The applications allow you to compare data. If you want to follow a low sugar diet, download one of these best health apps on your mobile device. According to studies, Yoga can improve the condition of a diabetic patient. In case you can’t run or go out for a long walk, learn and practice Yoga.